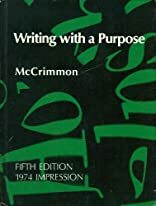 Writing with a Purpose has always been distinguished by its emphasis on the role of purpose in the writing process, its comprehensive coverage for first-year writing, and its effective use of examples and exercises. Designed as a four-in-one (rhetoric, reader, research guide, handbook) for one- and two-semester composition courses, this respected and reliable text has helped train countless students. The Fourteenth Edition includes streamlined coverage to allow for expanded material on such critical topics as research and argumentation. A technology program, Writing with a Purpose Online, allows students to access writing guidance as needed while drafting and revising. About James McNab McCrimmon (Author) : James McNab McCrimmon is a published author. 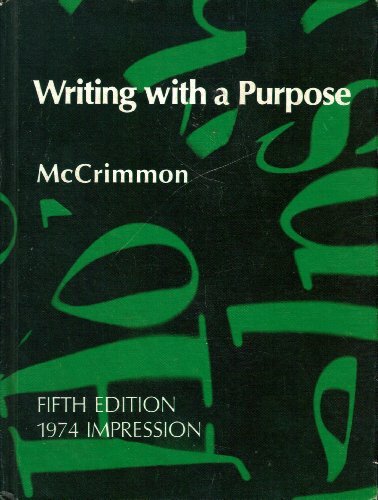 Some of the published credits of James McNab McCrimmon include Writing with a Purpose.